1. I am delighted to visit the Hebrew University and be amidst you today. 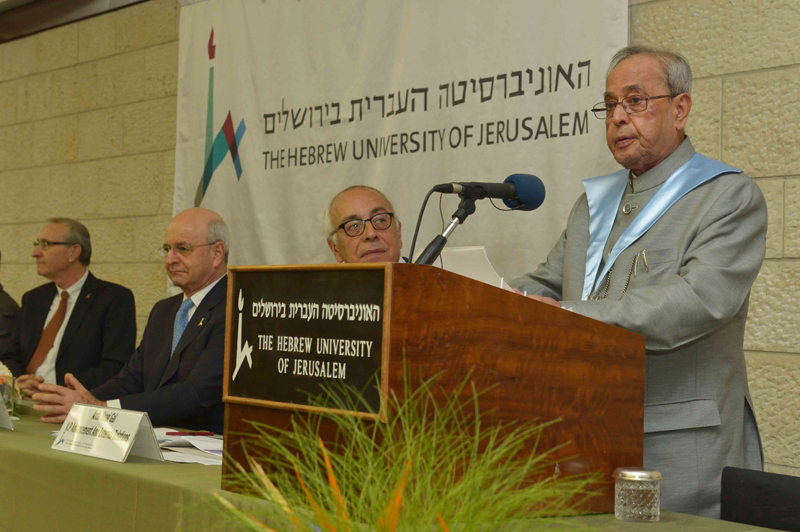 It is indeed a great honour for me to be the first Indian President to make a State Visit to Israel. Since my arrival, I have been touched by the warmth and friendly sentiments of the people of Israel. 2. I would like to express my gratitude to the Hebrew University for honouring me today with the Doctor Philosophiae Honoris Causa. 3. I greatly value this gesture of friendship. I, therefore, accept this doctorate as the President of India, on behalf of the people of India. It gives me great pleasure to be associated with this world famous University, one of Israel’s largest research and teaching institutions. I am aware of its magnificent libraries and their famed collections of manuscripts and ancient publications on Jewish thought and culture. I hope to someday have the opportunity to see some of these as well as the Albert Einstein Archives preserved here. 4. India attaches great importance to its friendship and partnership with the people of Israel. Our earliest linkages date back more than two thousand years. As you may be aware, India has a significant Jewish population descended from Jewish communities who came to India as far back as 175 BC. Hebrew has been taught as a subject in our educational institutions long before the State of Israel was established. 5. In modern times, our two peoples seem to have naturally revived these old affinities and embarked on a path of cooperation that has evolved into a close and multi-faceted partnership between our two nations. 6. As young nations with an ancient history, both India and Israel seek to develop and progress as knowledge economies. In the 20 years since we normalised relations, we have developed a close partnership in key sectors of defence, agriculture, cyber security and advanced technology. 7. I come at a time when India is at the threshold of a new era of modernisation and economic growth. Our Government has taken a number of initiatives to encourage foreign direct investments and stimulate the manufacturing sector of the Indian economy. The ‘Make in India’ and the ‘Jan Dhan Yojna’ for financial inclusion are two of many new initiatives undertaken by our Government. 8. With Israel, India has a number of complementarities in many key sectors. We are keen to realise the full potential of a partnership between our scientists and researchers. Both our academic communities have much to bring to the table. Eminent Vice Chancellors of premier Indian Universities have accompanied me on this visit to explore and pursue possible collaborations with counterpart universities in areas of shared interest. They hope to foster mutually beneficial academic exchanges, collaborative research and cross pollination of ideas between Indian and Israeli institutions of higher learning. India trains nearly 400,000 engineers every year. Israel, on its part, has proven itself in the field of research and technical innovation. India seeks Israel’s participation in our Digital India programme and the building of India’s smart cities and model villages. Your ideas and innovations could go a long way in achieving the goals of these flagship programmes of our Government. I invite you all to participate in the transformation of India. 9. Many of you may have travelled to India and some of you may be contemplating a visit. Travel itself is an educative and enriching experience. Our Government has selected Israel among the few countries to which it has extended the e-tourist visa facility. We do believe that increased exchanges at multiple levels will enhance the mutual understanding between our peoples. At the Knesset yesterday, I stressed the importance of institutionalising regular exchanges between our elected representatives. I am accompanied by the H’ble Minister for Social Justice and Empowerment, Mr. Thaawar Chand Gehlot and a multi party delegation of H’ble Members of the Indian Parliament. They join me in inviting you to visit India and contribute to the strengthening of the friendship between our peoples. 10. Since my arrival in Israel, I have frequently been asked how India is managing the largest functional democracy despite its huge diversity. For us, diversity is an integrating factor. We see unity in this diversity. India is a complex country of 1.3 billion people, 122 languages, 1600 dialects, 7 religions and a substantial presence of all three major ethnic groups – Caucasian, Dravidian and Mongoloid. As I have often said, its strength lies in its unique capacity to blend apparent contradictions into positive affirmations. In the words of Pandit Jawaharlal Nehru, India is a country held together and I quote "by strong but invisible threads…. About her there is the elusive quality of a legend of long ago; some enchantment seems to have held her mind. She is a myth and an idea, a dream and a vision and yet, very real and present and pervasive". With these words, Mr. President, I thank you once again.